Taylor Johnson calls on the play in the third quarter. Asia Durr scored 20 points as No. 9 women’s basketball dismantled Georgia Tech, 91-51. 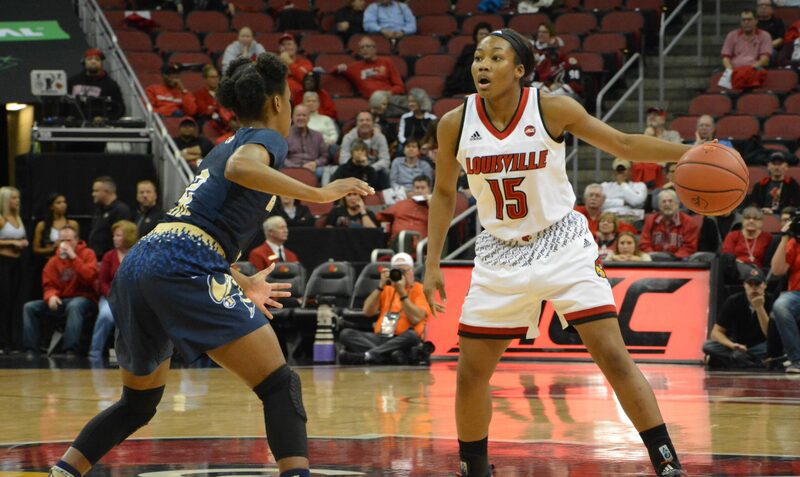 The Yellow Jackets failed to have a player score double-digits as U of L hits 56 percent from three. Louisville and Georgia Tech started on polar-opposite ends. U of L knocked down 11-of-17 shots in the first quarter to bust open a 27-13. Of Louisville’s first 11 made shots, eight were 3-pointers. Tech started cold. The Yellow Jackets only made 5-of-16 in the opening 10 minutes. During the second quarter, Louisville went on a 17-0 run while the Jackets missed 12 straight shots. Georgia Tech didn’t score a basket in over seven minutes, leading to a 50-15 Louisville lead. Louisville held GT to 6-of-30 shooting and out-rebounded the Jackets 25-14. Georgia Tech came out of the break and started a 4-0 run. Louisville’s defense loosened up during the third as GT scored 21 points. Louisville committed four turnovers after only committing two during the first half. Louisville entered the final quarter with a 39-point lead. The Cards held GT to under 30 percent shooting in the quarter. Kylee Shook hits a three during the first quarter. Jeff Walz looks on from the sideline. The bench looks to stay engaged during the blowout. Briahannah Jackson gets ready on defense. Asia Durr communicates with Jackson during the possession.